"Fun at the beach" can come in a wide variety of activities and adventures. 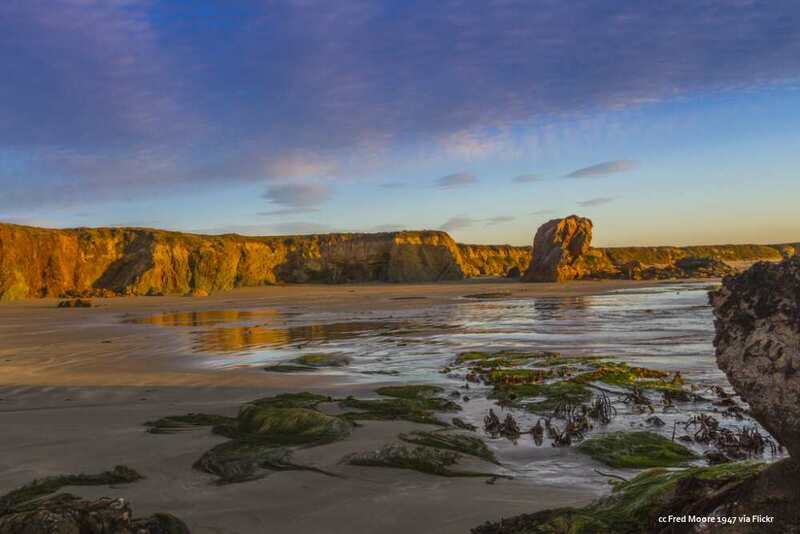 While you determine what's "fun" for you, I am providing a list of the more popular activities and adventures that can be found around the California central coast and from which you can choose. So, the beaches have the basic ingredients...sand, water, sun. And that just leaves you to add the fun thing that will relax and refresh you. Cruising along the sidewalk or a bike path and taking in the beach life and all its sights and sounds - that's pure fun at the beach. Monterey - Monterey has a wonderful Coastal Bike Trail, the great majority of which is dedicated bike paths. It spans the area from Pebble Beach all the way north to Castroville. Squadrons of pelicans patrolling the waters in search of fish; peregrine falcons; snowy plovers; California least terns - Great opportunities abound on the central coast if birding is your interest. Morro Bay hosts the annual Morro Bay Bird Festival. 217 species were sighted during the recent 2012 event. The next event will be held January 16-19, 2015. Oso Flaco Lake Natural Area is another nice birding area. Just behind the dunes it is a riparian and lake environment with a nice walkway. Elkhorn Slough Estuary Reserve - Over 200 bird species have been recorded here making this one of the richest bird havens on the central coast. Located north of Monterey at Moss Landing, there are tours of the Reserve every Saturday and Sunday along with a birding tour on the first Saturdays of the month. More information along with directions are available at the Elkhorn Slough page. There are a number of options for exploring the great complex of dunes for a day of fun at the beach. There are a number of ATV rental places in Pismo Beach and Oceano if you want "hands on" fun in the sand. If you would prefer a guided tour, there is a company offering Humvee rides through the dunes. Lots of folk find "wetting their line" the most relaxing activity. 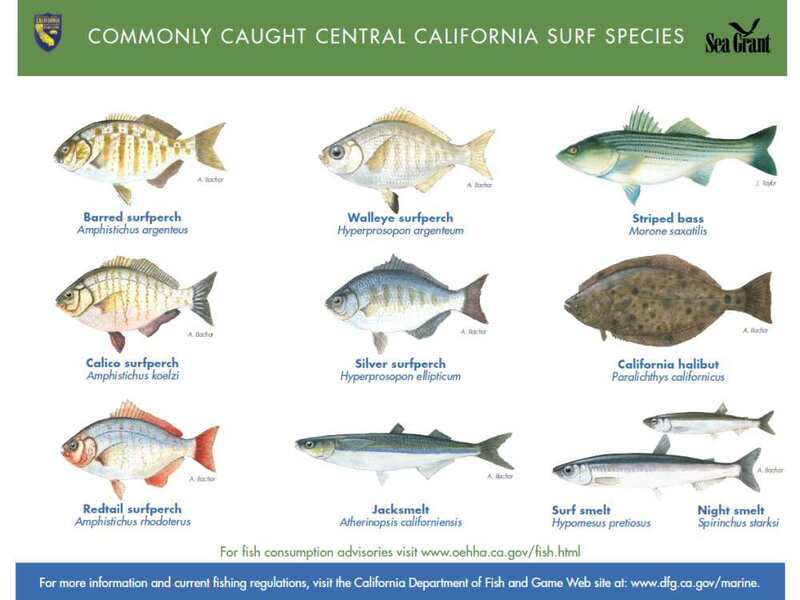 There are many delicious varieties of fish found along the Central Coast, and several ways to catch them. 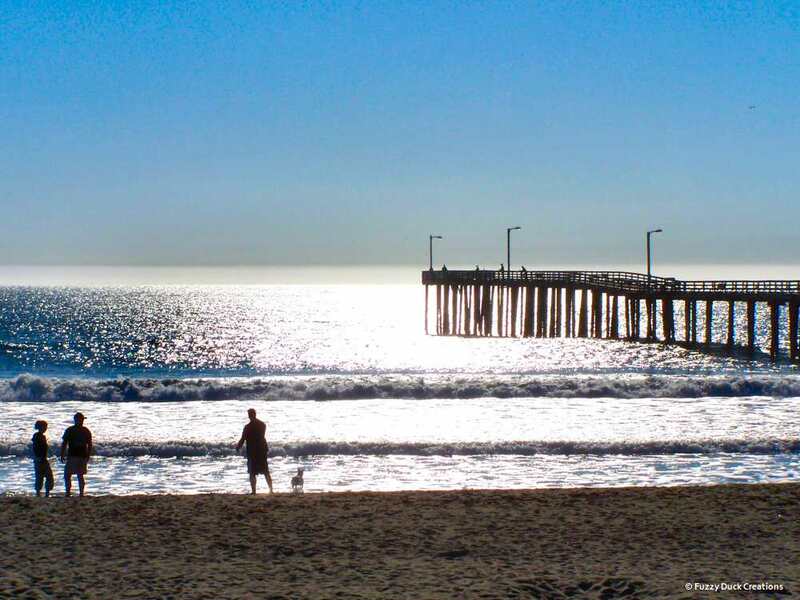 Pier Fishing: No license is required for fishing off a pier in California. Here is a page with maps and information about piers in the area. Grunion Runs - Though some suspect that grunion are fictitious, something like "snipe hunting" or watching the "submarine races", this is for real. The grunion is a fish that periodically comes to shore and lays its eggs in the sand. A fishing license is required, the grunion can only be caught by hand and more information can be found here. Deep-sea fishing - There is very good fishing off the Central California coast, with many varieties of game fish to be had over the course of the year - cabezon, rock cod (very good eating), halibut (even better eating), salmon and tuna. Sport fishing boats leave from Avila Beach, Morro Bay and Monterey. In Avila Beach, Patriot Sport Fishing is the place to go. Virg's Landing in Morro Bay has been a fixture for over 60 years. If you're in Monterey, check out Randy's Sport Fishing. Point Sal State Beach - A "moderately strenuous" round-trip hike of 12 miles from the parking area to the beach; an elevation change of 1200'; NO facilities at the beach - if you're game for this you probably won't find many other visitors here. It's a wild and undeveloped part of the coast. Part of this area is owned by the County of Santa Barbara which has information on how to get to this beach. The State Beach phone number is 805-733-3713. Estero Bluffs State Park - This is another undeveloped area, but the hike is much easier than Point Sal. "Oceanside pullout couple miles north of Cayucos. Park a half mile north of San Geronimo Road. Follow the path to the fence then down to the tidepoolsand/or continue north on the path around the bluff back to north of the parking area." The turnout area is 8.25 miles south of the Highway 46 and Highway 1 intersection. GPS coordinates for the parking area are: 35.4508 / -120.9417. Harmony Headlands State Park - HHSP is another nice and easy hike from the parking area to the beach area. GPS coordinates for the parking area are: 35.4783 / -120.99187. Approximately 5.75 miles north of Cayucos and 4.75 miles south of the intersection of Highways 1 and 46. There is a portable toilet not far down the trail. No dogs allowed since there are nesting sites for snowy plovers. State Park information: (805) 772-7434. The hours are 6am - sunset. 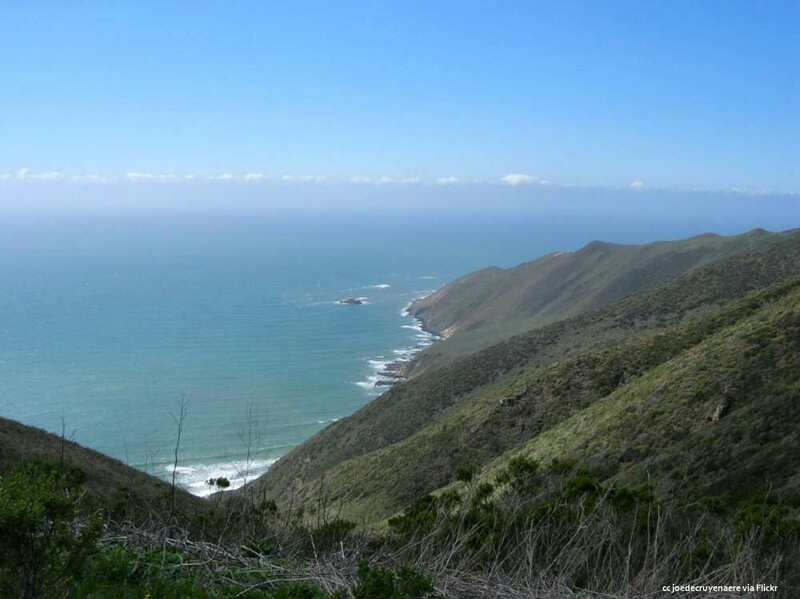 Garrapata State Park - Beach hiking in the Big Sur area - all the information you need is right here. PG&E Hikes: Point Buchon and Pecho Coast Trail - The local utility company, Pacific Gas and Electric, owns a sizable portion of the coast between Montana de Oro State Park and Avila Beach. There is no free access to this area but the company has established guided hikes into the area from either end. The Point Buchon trail enters from the south end of Montana de Oro while the Pecho Coast trail is accessed from the Port San Luis pier. Reservations are highly recommended and a waiver is required for these hikes. Days, times and descriptions along with online forms for reservations are available at the PG&E Trails! page. Andrew Molera State Park - if you thought riding on the beach is a great idea, how about riding on a Big Sur beach? Molera Horseback Tours - all rides go on the beach. How about a tour on horseback through the Oceano Dunes? If you are in the Cambria area here is another option for a trail ride with beach views.